The alarm was set for 1am but by 11:30 I was wide awake and no chance of going back to sleep. Katja was snoring away in her bed and Cathy was fast asleep too. I did a couple of mental checks to make sure we had everything and waited for the alarm to go off. We set off at bang on 2am which is pretty good going. The air was hot and humid as it usually is this time of the year. We were about 10 minutes into our drive when I suddenly remembered I had forgotten to bring the bottles of water which had been left in the fridge overnight. We couldn’t really head on a trip like this without water in the car and having heard that facilities along the road are few and far between, we decided to head back home and pick up the bottles! Now we had water in the car, we were now heading off into the night. Traffic began to thin out as we were heading away from the city. 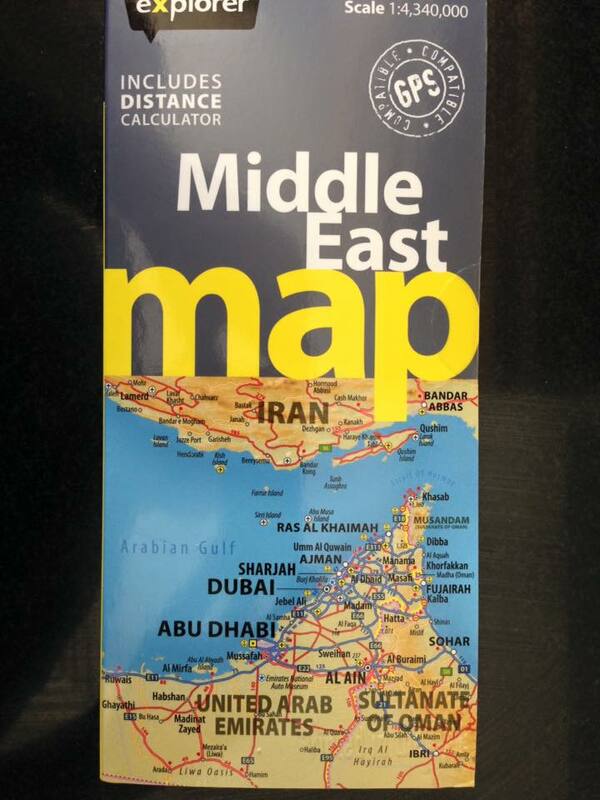 We had Waze (GPS application on the phone) running as well as a Middle East map at hand. As there’s one way in and one way out of Qatar (as far as I know), we felt that we could rely on Waze (what could possibly go wrong?!). We were driving along the motorway merrily when Waze decided it was time to leave the main road, I sort of unintentionally on purpose missed the junction to give us a chance to check the map too but (foolishly) did a U turn at the next available junction and listened to Waze. 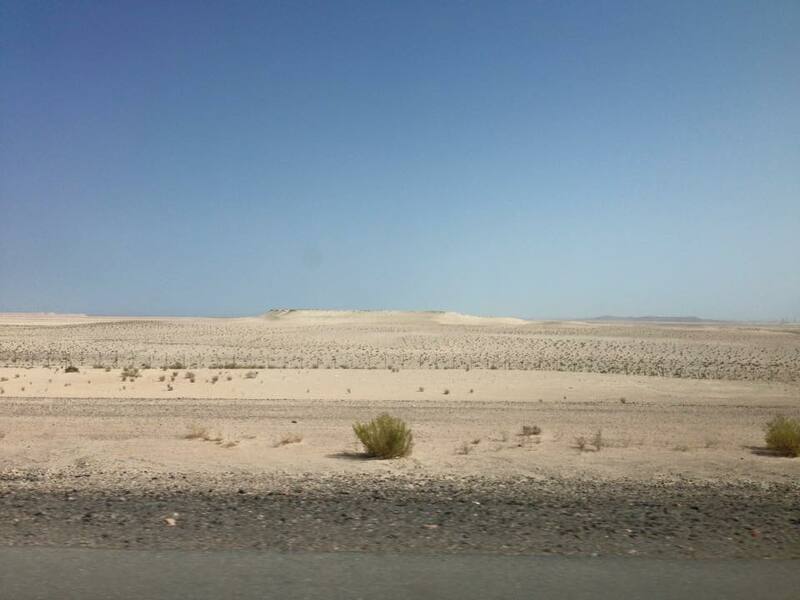 We came off the motorway and headed off into the pitch black desert along a suspiciously unused tarmac road. We drove some 20 + km and came across one, maybe two cars. My biggest concern was a camel deciding to “hop” in front of us! Fortunately, this didn’t happen. Eventually after about 1/2 an hour of driving along this pitch black road we came to a section of the road with block forcing us to zig zag and eventually a sign “Switch Lights Off”. Ahead of us were some barriers and what I can only describe as a rudimentary hut on our right hand side. I stopped and wondered if perhaps we may be somewhere we shouldn’t be. A bemused guard surfaced from the hut soon after. Even in pretty much pitch black I could tell this guy was wondering what the hell was going on. He approached my side of the car and at this point we both realised neither of us spoke each other’s language. I tried to explain that I was looking for the Saudi Arabia border. He disappeared briefly and brought out his mate who spoke some English. After taking all my details (from my ID card), writing down my number plate etc etc, he proceeded to tell me that this border post had been shut for traffic for more than 20 years! I apologised profusely while trying to explain that this stupid GPS had brought us this way. I don’t think he cared too much, it was now 3:30 am and he just wanted to see the back of this stupid foreigner who once again relied on technology instead of common sense. We drove back and eventually got onto the right road! 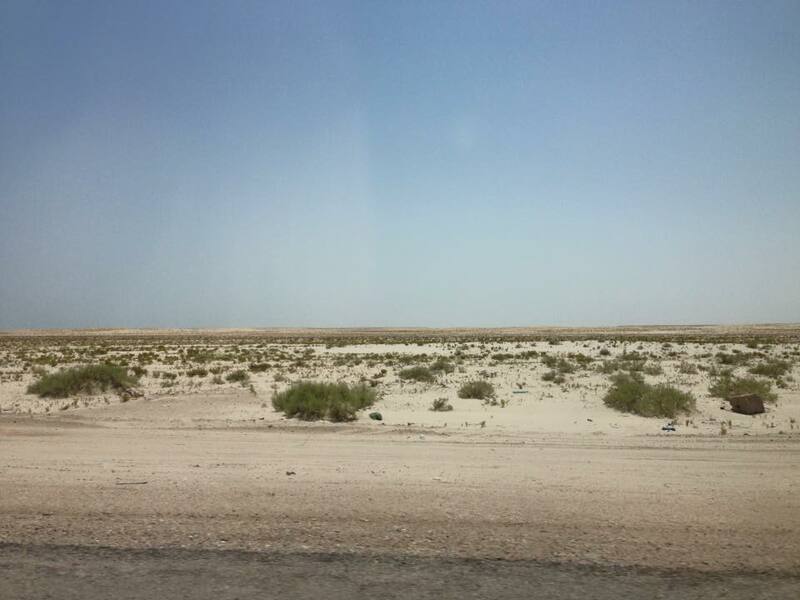 We cleared the Qatari border crossing and customs, a few kilometres after driving through no-man’s land, we arrived at the Saudi Arabian border. 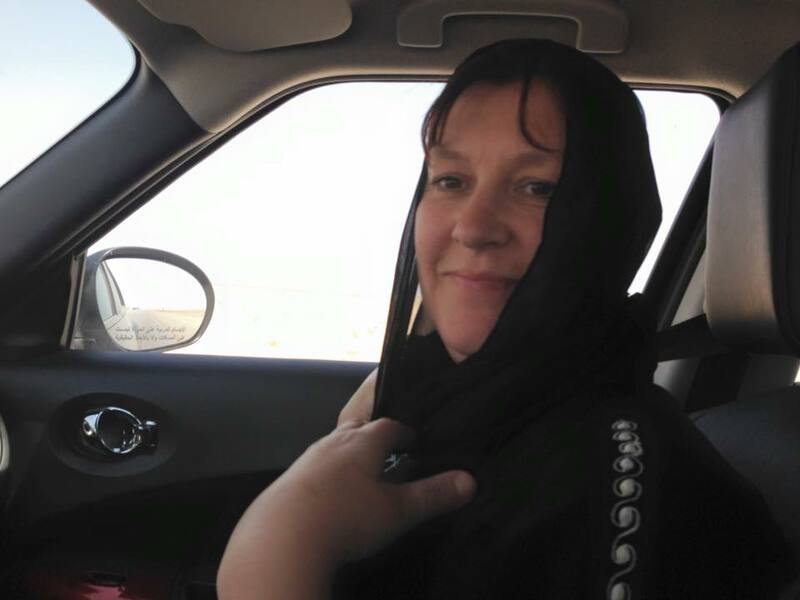 Cathy had her abaya and head scarf on for this section of the trip. I popped into the male office and had my fingerprints done as well as an iris scan, Cathy and Katja’s passports were checked and soon after I was back in the car. It was now Cathy and Katja’s turn to go to the ladies section and do fingerprints and iris scan. If you are unaware of this, in Saudi Arabia there is full male/ female segregation so you have one office for women and one for men. 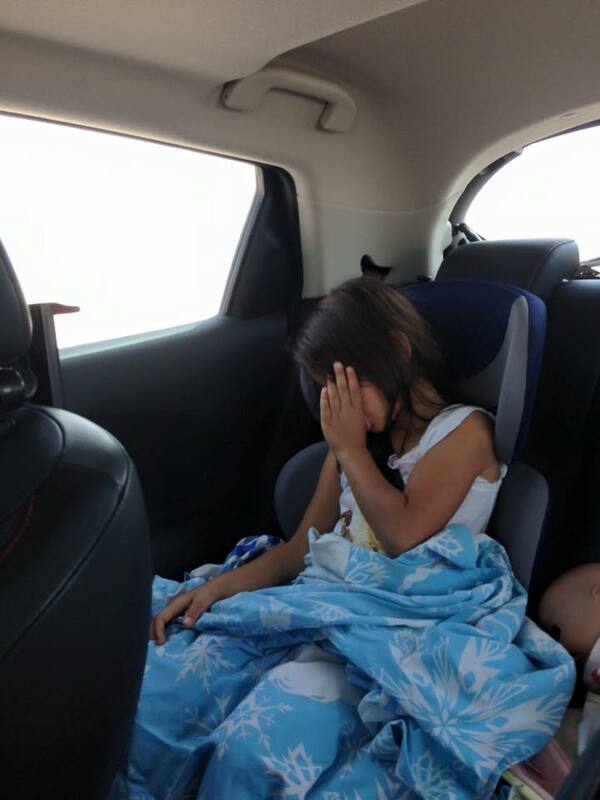 A few minutes later, the girls were back in the car and we were ready to go through immigration and customs. This was relatively simple and straight forward. The final booth stop was to pay for car insurance for 2 weeks. 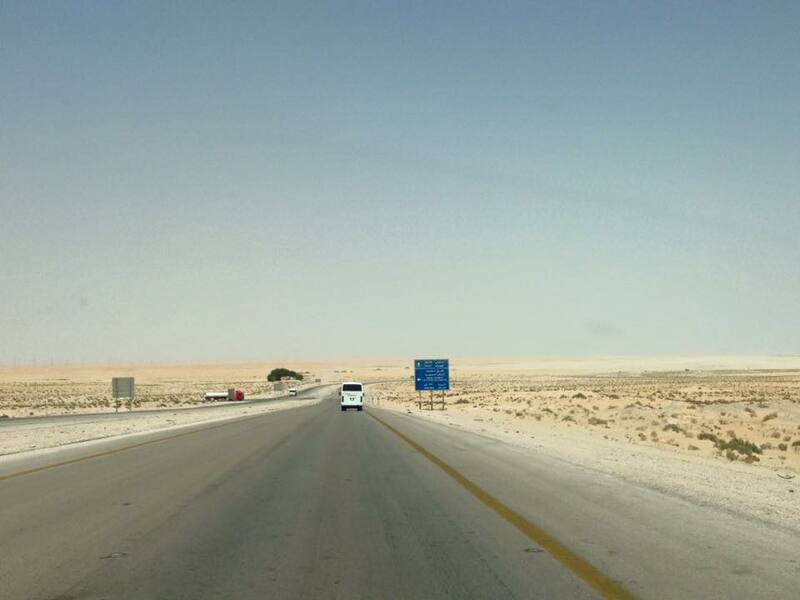 About 30 minutes after we had arrived at the Saudi border we were back on the road, we were now driving in Saudi! 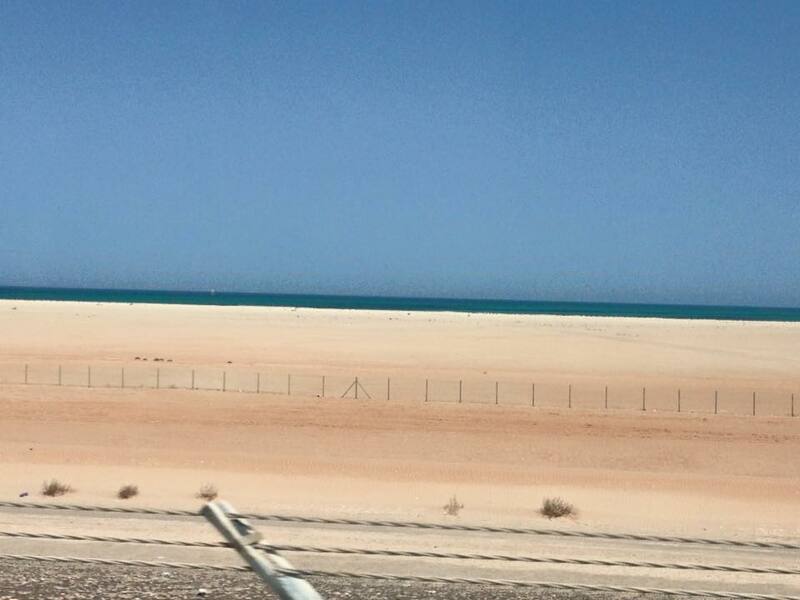 The section of road between Saudi and the UAE (United Arab Emirates) border isn’t particularly thrilling. Most of it is dual carriageway without a central reservation, this means that every so often you will have cars doing U turns and on a couple of occasions, simply driving the wrong way! 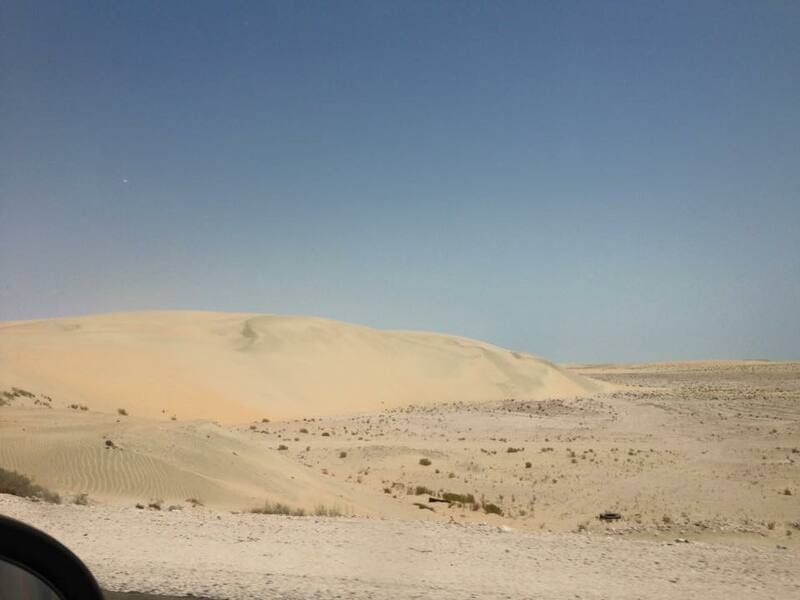 What’s interesting to see is that the desert changes as you are driving along, there are a few more sand dunes and wild camels, as a desert goes, it is a bit (but not much) more picturesque. What really called my attention is that there are hardly any signs of civilisation as you drive along, one big(ish) conglomerate and that’s about it. 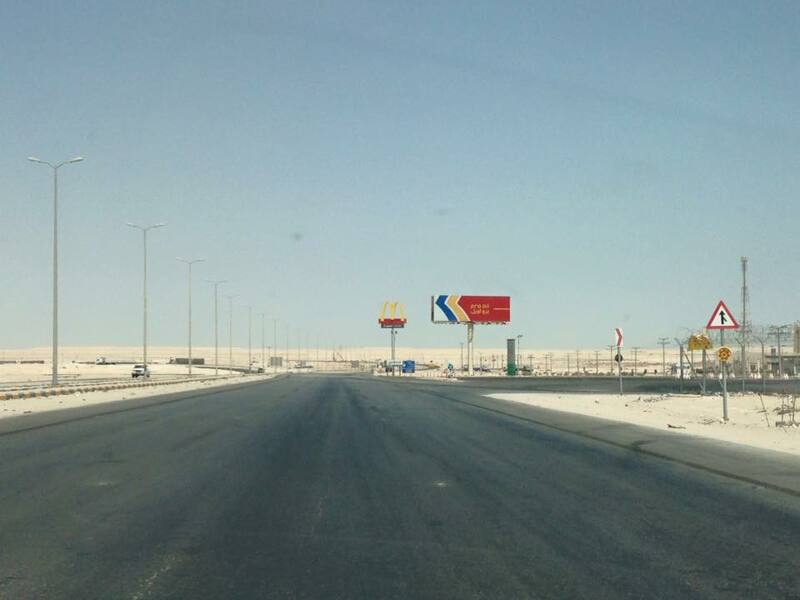 Oh yes, there’s a McDonald’s and petrol station just before the UAE border! We cleared Saudi Arabia customs and were now about to enter the UAE. We had to park up and walk into immigration office. This is a large and nicely decorated building with lots of counter space and not a soul in sight, other than one person sitting behind the counter, looking a bit bored and then bemused by seeing these two westerners with a kid speaking English. She looked at us and in a friendly manner and voice asked if we were British. Her colleague soon joined her and gave us the forms to fill in. He sorted our applications our pretty quickly and we were soon back in the car. We then had to go through clearance. I was asked to get out of the car and to show them what I had in the boot (lots of presents for Katja’s birthday!). A very friendly guard asked me what was in the bags etc so I whispered into his ear so Katja wouldn’t hear. He found this quite amusing and soon sent us on our way! 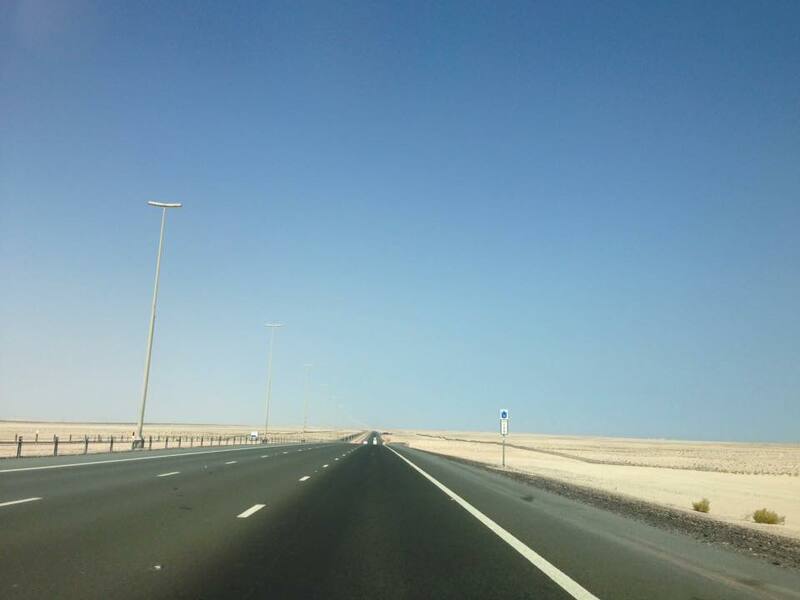 The final part of our entry into UAE was to pay for car insurance which we did for 10 days. 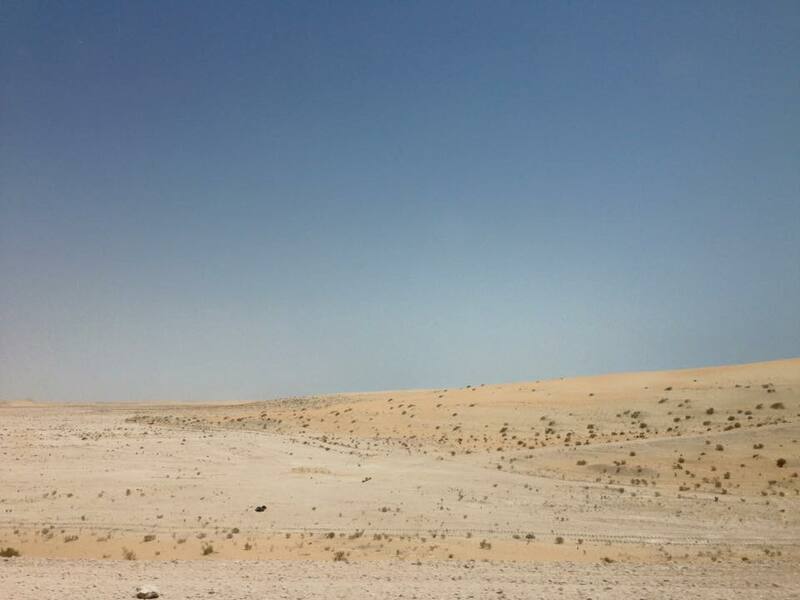 The section of road between the Saudi border and Abu Dhabi isn’t too exciting either. It is also lacking in services too. I think we counted two or three in a near on 400 km stretch! One sign even said “Last Petrol Station for 200 km!). Eight hours after leaving home we arrived in our hotel in Abu Dhabi, tired but excited and ready to explore.